A look at some of the farmhouse pieces inside of Julie Guidry's store The Gilded Sparrow. Photo by Jordan Hefler. 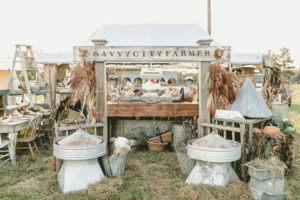 For Julie Guidry, owner of The Gilded Sparrow, Louisiana was lacking something similar to the City Farmhouse Pop-Up Fair that she had been attending in Franklin, Tennessee, for years. 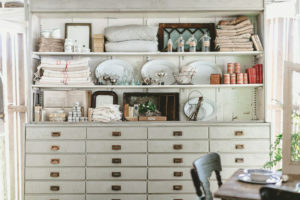 Guidry’s Denham Springs store displays a wide selection of unique farmhouse style pieces, proving that her passion for all things farmhouse décor was a driving force behind her desire to bring this fair to the boot. Guidry reached out to Kim Legget, the owner of City Farmhouse and best-selling author of City Farmhouse Style, to help bring some farmhouse flair to southeast Louisiana. The City Farmhouse Pop-up Fair in Franklin, Tennessee, showcases styled spaces with a rustic touch. Photo courtesy Kim Leggett. These two powerhouses are combining forces and hosting a City Farmhouse Pop-Up Fair at the Lamar-Dixon Expo Center today, Thursday, February 22, through Saturday, February 24. The fair will feature wares from vendors around the country. Attendees can expect to see vignettes like this one from a similar Tennessee show. Photo courtesy Kim Leggett. The entire weekend will be filled with more than just décor, however, with a celebratory-like atmosphere permeating throughout the event. The Chase Tyler Band will kick things off with a performance at tonight’s Preview Party. For the rest of the event, guests are invited to view spaces styled and merchandised in vignettes that showcase ways to incorporate each style into your home or business. Those who wish to attend are encouraged to go online and purchase their weekend passes here. To learn more about The Gilded Sparrow and the City Farmhouse Pop-up Fair, read this story from the inRegister archives or visit thegildedsparrow.net.